The Hanover trade fair offers a wide range of synergies and calls itself the Hotspot of Industry! From 01 to 05 April 2019, the eyes of the world are on Hanover. More than 6,500 exhibitors and more than 220,000 visitors from all corners of the globe are expected. 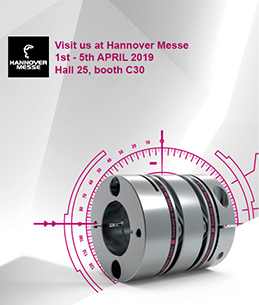 R+W Antriebselemente GmbH greets its visitors at its usual booth C30 in hall 25 and presents the world of couplings for precision and industry. On a 120 m² space, the medium-sized enterprise from the Untermain region of Bavaria and market leader in the field of metal bellows couplings is showing digital communication exhibits. Dive in to the digital world of precision and industrial couplings. In addition to the existing product range, a new SCL servo disc pack coupling will be launched. The product is predestined for mechanical engineering applications in which increased flexibility is required. The couplings compensate for higher misalignments while reliably transmitting the required torque in the range of 25 to 100 Nm. Kai Kupplung can also be found on the trade fair premises or at the R+W trade fair booth. You are invited to spend some time in the R+W Lounge (Hall 25, booth C30). During a stressful trade fair day, you can literally recharge your batteries and get some peace. The plentiful information from the trade fair visit is easier to take in with a relaxed atmosphere and a free drink along with a more in-depth discussion – come in and find THE COUPLING. If you would like to meet Kai and/or obtain a place in the R+W lounge, make arrangements here.